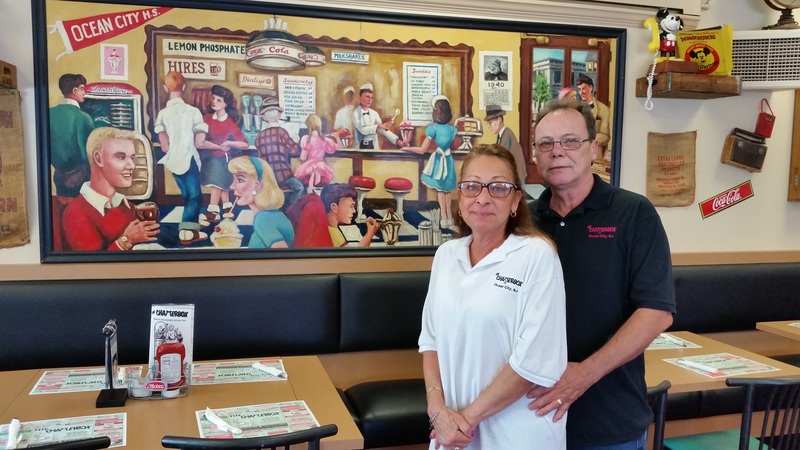 Owners Maria and Bob Boyer, who bought the Chatterbox in 2014, stand in front of a historic mural that serves as a centerpiece in the dining room. Customers strolling through the doors of the Chatterbox Restaurant might think they have passed through a time portal transporting them back to the 1950s. 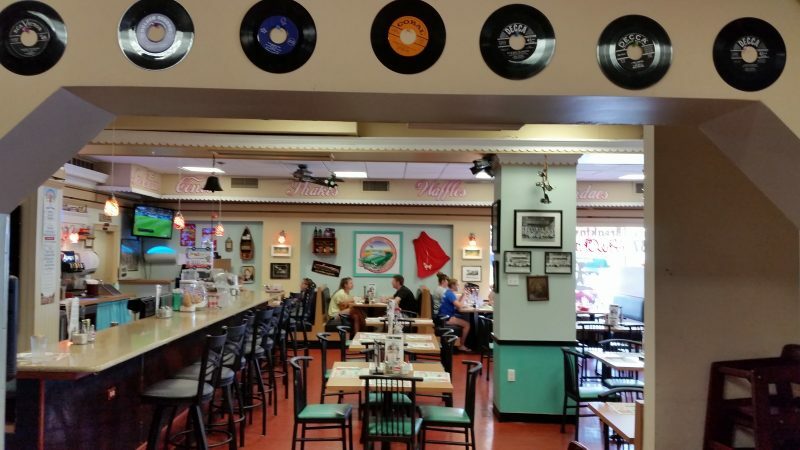 The Platters croon their 1955 hit “The Great Pretender” over the loudspeaker, old 45 rpm records tacked on the walls serve as old-school decorations and a neon Pepsi Cola sign behind the counter is faintly reminiscent of the Eisenhower era. Yo, all we need are Richie and Fonzie from “Happy Days” to stop by to make this nostalgic atmosphere complete. Although the reproduction retro-chic look may be trendy in some modern restaurants, the Chatterbox is an authentic throwback to the 1950s. 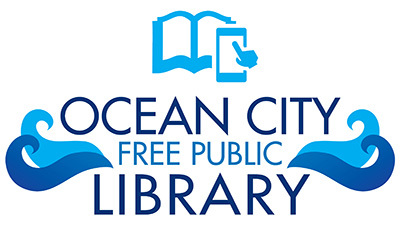 Actually, it traces its roots to 1937, when the original owner, Jean Campbell, opened the family-style eatery in downtown Ocean City. 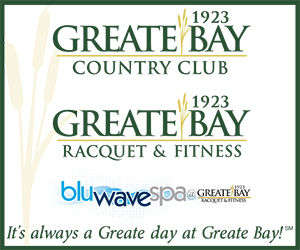 The current owners, Bob and Maria Boyer, will celebrate the restaurant’s 80th anniversary on Friday with a cake-cutting gala open to the public. Slated to get underway at 11 a.m., the celebration will last as long as the free cake holds out, the Boyers said. 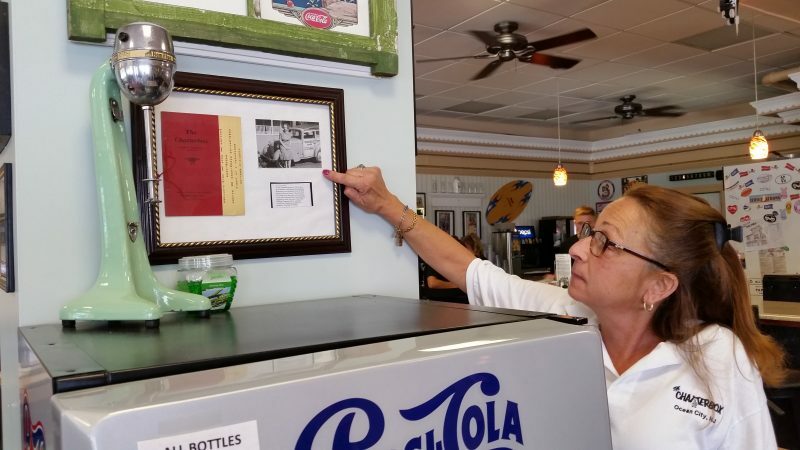 Maria Boyer points to an old black-and-white photo of the Chatterbox’s original owner, Jean Campbell, who opened the restaurant in 1937. Jean Campbell will also be there to greet customers, sort of. She has been immortalized in an old black-and-white photo from 1941 that shows her standing in front of a delivery truck. The picture frame containing Campbell’s photo also includes an old Chatterbox menu from the 1930s. Campbell’s photo peers out over the main dining room, ensuring that she will be a permanent fixture at the restaurant. 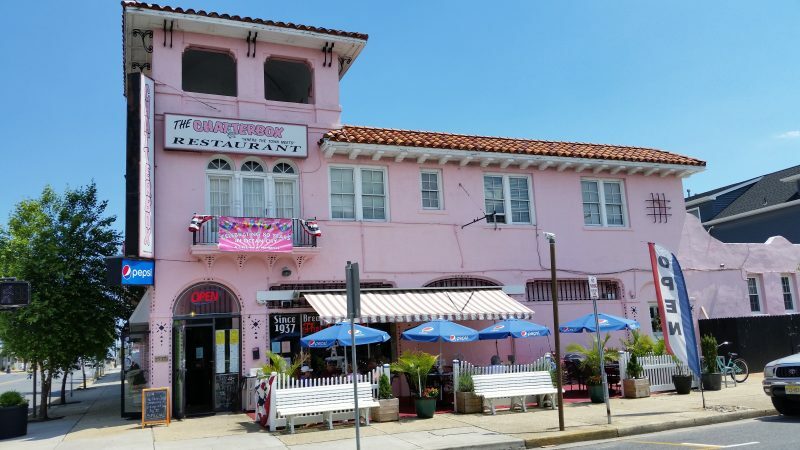 Beginning with Campbell’s ownership, the Chatterbox has been touted in its advertising slogan as the place “where the town meets.” Impossible to miss, the iconic, pink-hued, Spanish Mission Revival-style building occupies a prominent downtown location at the corner of Ninth Street and Central Avenue. The landmark building, bathed in a distinctive pink color scheme, occupies the corner of Ninth Street and Central Avenue. The Boyers decided to preserve the restaurant’s 1950s-era décor when they took over. While that aspect of the restaurant is clearly rooted in the old days, other parts of the Chatterbox have evolved to keep pace with modern tastes. A new chef was brought in by the Boyers in 2014 to make changes with the menu that reflect the trend for healthier eating. An emphasis is placed on serving fresh fruits and vegetables bought from local farmers. Gluten-free meals are available. The Chatterbox also roasts its own meats. To keep meals affordable for families, the restaurant offers a $5.99 daily lunch special. There are other quaint, family-style touches, such as serving children’s meals in paper containers that look like vintage cars. The children can take the cars home. 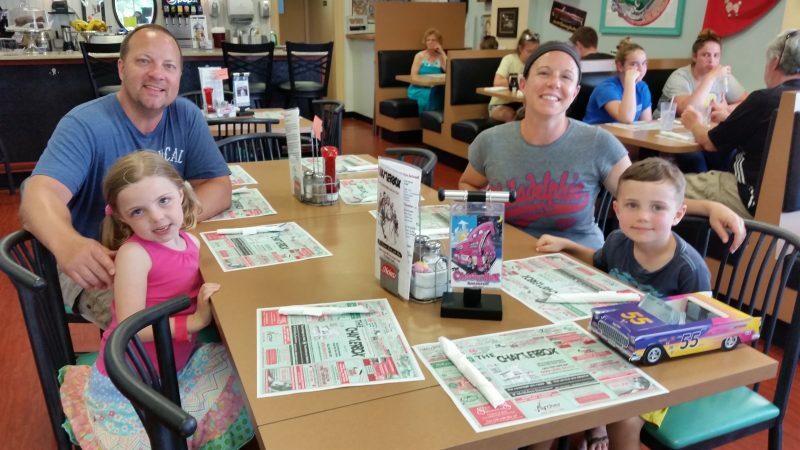 Dan and Lauren Jordon, of Cinnaminson, along with their daughter, Ella, 6, and son, Max, 4, had lunch in the family-friendly restaurant. For people who want to bring their family dog along, the restaurant’s outdoor dining section is pet-friendly. Inside, though, only service dogs are allowed. Individual booths and tables offer comfy seating for customers, but the Chatterbox can also accommodate large groups, the Boyers said. Altogether, the restaurant has 175 seats, including the outdoor patio area. 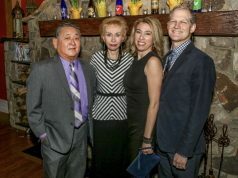 The Boyers, who have been married for 35 years, were no strangers to Ocean City’s restaurant scene when they bought the Chatterbox. 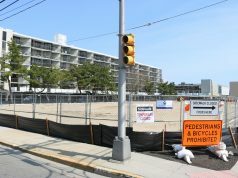 Previously, they had owned Tory’s Ice Cream Parlor, a now-gone eatery formerly located at 33rd Street and Asbury Avenue. As rumors swirled a few years ago that the Chatterbox might be demolished and redeveloped, they were partly motivated by their desire to save the restaurant. 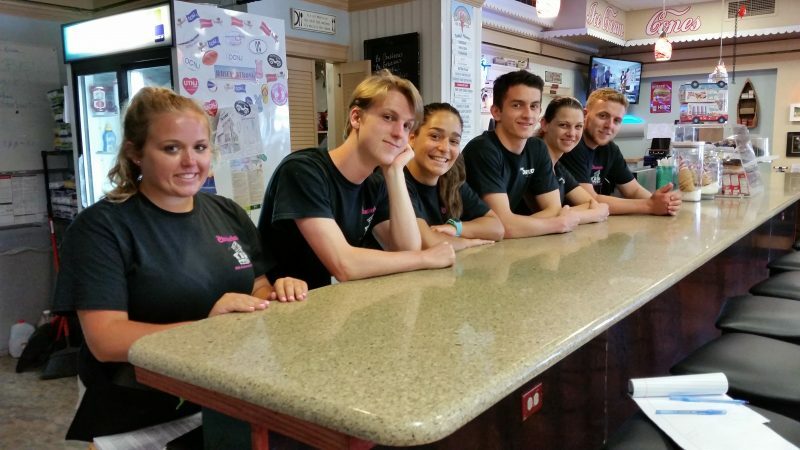 Employees enjoy a relaxing moment at the Chatterbox counter. Renowned architect Vivian Smith, an Ocean City native, designed the Chatterbox, according to the restaurant website. 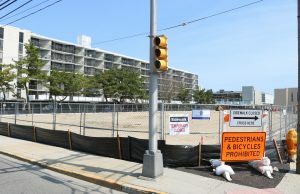 Smith also designed other Ocean City landmarks, including City Hall, the Music Pier on the Boardwalk and the historic Flanders Hotel. On Oct. 29, 2012, the Chatterbox suffered what may have been its biggest blow. Hurricane Sandy badly damaged the restaurant, along with other countless buildings on the island. A water line inside the restaurant shows just how deep the flooding had surged. The restaurant was gutted and remodeled. After the renovations were completed, it reopened in May 2014. Among the items saved from the floodwaters was the Chatterbox’s historic mural, which whimsically depicts a nostalgic scene inside the restaurant, right down to bobby-soxers dancing to the tunes from a Wurlitzer jukebox and a soda jerk serving up a sundae. The mural is the centerpiece of the Chatterbox’s – What else? – 1950s décor. Old 45 rpm records attached to the walls add to the nostalgic atmosphere.